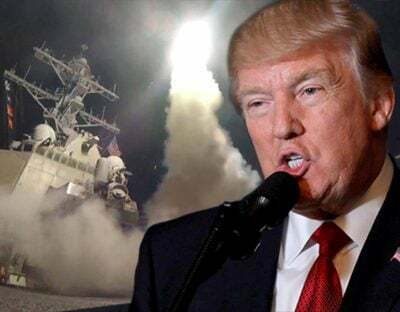 A report yesterday by the Pulitzer-prize winning reporter who broke some of the biggest stories of the Vietnam and Iraq wars showed that Trump bombed Syria on April 4th based upon false pretenses. Specifically, Trump said the Syrian government carried out a chemical weapons attack on civilians. But U.S. military and intelligence officials say that they told Trump there was no evidence for that claim … and they say that what really happened is that Syria bombed Islamic terrorists, and that accidentally released chemicals being stored by the terrorists. So how does Trump respond to the report? The United States has identified potential preparations for another chemical weapons attack by the Assad regime that would likely result in the mass murder of civilians, including innocent children. The activities are similar to preparations the regime made before its April 4, 2017 chemical weapons attack. If … Mr. Assad conducts another mass murder attack using chemical weapons, he and his military will pay a heavy price. Any further attacks CARRIED OUT BY THE SYRIAN GOVERNMENT and done to the people of Syria will be blamed on Assad, but also on Russia & Iran who support him killing his own people. Anything bad happens – whether it’s carried out by Assad, or ISIS, or Al Qaeda, or outside forces trying to destabilize Syria – it will be blamed on Assad as a justification for a lot more bombing. Postscript: This little game has been going on for 68 years. Specifically, the U.S. government has been trying to replace the Syrian government with folks who will be subservient to America since 1949 … 3 years after Syria became an independent nation. The CIA succeeded in carrying out a coup in Syria 1949. In 1957, the American president and British prime minister agreed to launch regime change again in Syria using a false flag. (False flags are not only historically documented, but presidents, prime ministers, congressmen, generals, spooks, soldiers and police have ADMITTED to planning and carrying out false flag attacks). In 1983, 1986, 1991, 2001, 2009 and 2012, American officials again schemed about regime change in Syria.